Please use this page to add your favourite memories of Rupert and the Frog Song. Perhaps the joy of the first time you saw it, perhaps it reminds you of your childhood? Let your heart spill out… Also read other memories from fellow frog fans! Please also write down any comments you may have about this website. We reserve the right to edit, delete, or not publish memories. Let’s talk about Rupert and the Frog Song. I remember when I had the VHS. 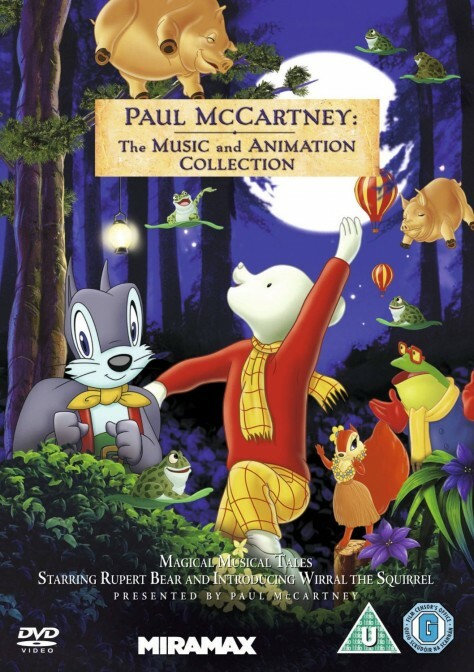 With two bonus cartoons by Paul McCartney’s wife. Known as Linda McCartney. Seaside Woman & The Oriental Nightfish. However, the first logo was Family Home Entertainment. (F.H.E.) Saw it on the Disney channel too. Now I have the DVD, including Tropic Island Hum & Tuesday. It’s better that way. Me dad bought my siblings and I the Rupert And The Frog Songs VHS back in 1989, and I absolutely fell in love with the video and can't remember how many times I've played it. Till this day when I see frogs, I get the urge to sing We All Stand Together!! This film, in me eyes, is a true classic and I recommend for all to show their children and grandchildren. Oh my gosh there's must be thousands of frogs in Rupert & The Frog Song. I just can't count them all. Now my six grandchildren visit and walk around the house making frog sounds to the video......umm Grandpa sings along too. My Year One class are performing this tomorrow in their assembly. Its going to be brilliant! I remember riding my motorcycle to see this wonderful film, along with Give My Regards to Broad Street, when I was a teen. Wow i love it! Gosh i felt like a kid again singing along to the video!! Great work guys enjoyed your site loads! My nephew is 2 years old and loves this video, I was my favorite when I was young and now it's his! Rupert is so so so so so so so so so cute, good, beautiful, nice and lovely. We all stand together! I remember when I was younger thinking how the owl is rude, mean and bad, lol! But I always thought Rupert was nice and kind and cute. We all stand together! I was only 4 or 5 when i saw Rupert and the frog song for the first time and till today it's always on my mind. the frogs jumping and singing... how about the noisy fish or sing-a-long cats? you know, i have a parrot and this is his favorite song. everytime he hears it he starts to dance up and down just like the frogs and he also sings it. it's very funny! It is a memory of my childhood. Really nice music.